Who would’ve guessed that Brussels sprouts would become such a thing? They’ve transformed from the very bottom of the list of Delicious Vegetables, just below lima beans, to Princess of Pinterest recipes (quinoa is Queen, obvs). And this thrills me because I love those mini cabbages, especially if they are roasted or broiled, as this recipe calls for. These were served at our Thanksgiving in 2014, and, like everything offered there, were wonderful. Heat oven to 375. Slice the Brussels sprouts in half and place in a baking dish. Drizzle the oil over and then sprinkle liberally with salt and pepper. Bake for 30 minutes or until the sprouts are beginning to color and even get crispy in parts. Remove from the oven. 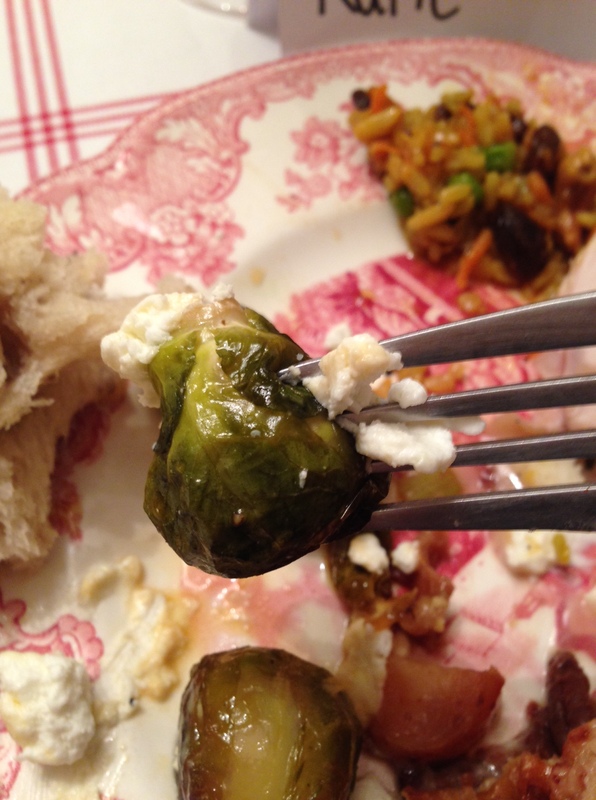 Drizzle the honey and sprinkle the goat cheese over the hot sprouts. Serve warm.